When a plan has been purchased you will receive an email notification – you just need to set it up so you always aware of new customers! The template is accessed by searching for "Email Templates" in the global search, or by going to Settings > Communication > Email Templates. 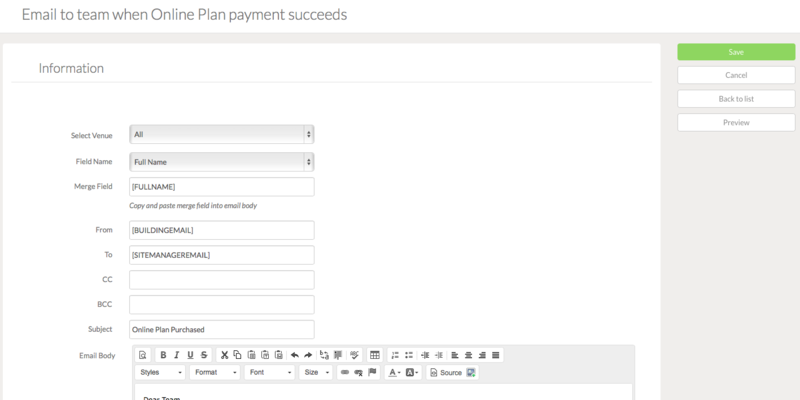 Click on the "Online Plans" folder and click on the green pencil icon next to the template called ‘Email to team when Online Plan payment succeeds’ to edit it. Edit the template using the available merge fields by copying and pasting them into the email body. In the To, CC and BCC enter the email addresses of the team member(s) that you want to notify when a new plan is purchased. The From will use the master email address for the Portal if you leave it blank, or you can specify another ‘From’ email address (it must be a genuine email address).